25 | March | 2009 | Oh Look, Krill! 1) Cream of mushroom soup with big chunks of ‘shrooms, with a few drops of tobasco sauce and crunchy garlic bread on the side. 2) Pasta cooked to al dente and then mixed with good pasta sauce. 4) Eggplant lasagna, heavy on the cheese and red sauce. 5) Fruit sherbet for dessert. On Sundays, I would normally roll around in bed until about eight before flopping down on the couch in the living room to watch some Japan Hour and that Korean show. However, last Sunday was a totally different matter. A cousin of mine informed my sister and I that the Starbucks branch where he was working, was having a coffee presentation. He didn’t have to work hard to convince us to go, well, me mostly since my sister could care less about coffee. I was up at the crack of dawn and after a quick breakfast, we made our way down to The Cathay. As usual, we were early so we sat down with a cup of chai tea latte and a mango passionfruit blend. By the time we finished our drinks, it was time for the coffee presentation. They were introducing the House Blend and the correct way to steep coffee using a french press. 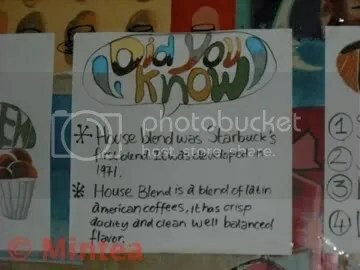 What you didn’t know about the House Blend. According to the Coffee Master, the best temperature for coffee is just under boiling. He said to turn off the kettle once the water has boiled and allow the water to stand for a short while. The coffee must be freshly ground to give the best taste. The coffee was allowed to steep for about four minutes before depressing the plunger. The coffee must be drunk within twenty minutes to retain the freshness. After explaining how to make the coffee, he taught us the proper way to appreciate it. Yes, there are proper steps to drinking coffee. There was much slurping and tasting and I definitely enjoyed the free coffee. 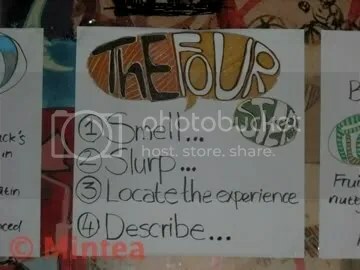 We were then asked to describe what we tasted. 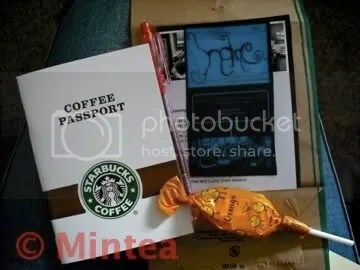 At the end of the presentation, each of us were given a gift that included a Coffee Passport, a lollipop and a pen. I thoroughly enjoyed the coffee presentation, not only because I had free coffee, but because … well, ok, because of the free coffee. The presentation left me feeling that I needed to get that french press right now but it’s a good thing I didn’t get it since I didn’t have a coffee grinder either. How about that? Do you think I’ll get all of it for my birthday? 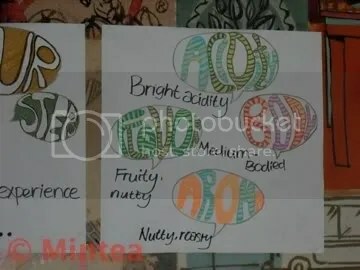 Categories: Coffee, food, Life | Permalink. 1) Taking a nap does wonders for the monthly cramps issues. 2) Being inside and curled up under the duvet when there’s a lightning storm raging outside. 3) The laughter that Twilight gives me, even though I’ve already watched it more than a few times. 4) Make up, especially eyeshadow, eyeliner and mascara. 5) Special features for a movie on the DVD sets.